who served with the Royal Air Force. Bowen-Bravery, Squadron Leader Kenyon (Distinguished Flying Cross). Aged 90. Pilot. Lancaster LL811 J-Jig (Bad Penny II), No. 550 Squadron, Royal Air Force. Sept 2013.1 (No. 550 Squadron history 1 pdf), (No. 550 Squadron Association), (No.550 Squadron history 2). 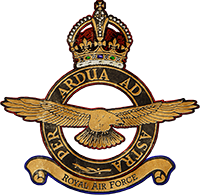 If you can provide links to any published obituaries for any Royal Air Force Normandy Veteran, or their details, please add them to the comments box below.